NYPA has ensured that New York taxpayers are getting the best investment possible for their EV charging station infrastructure. EV Connect, the full-service one-stop shop for commercial and governmental electric vehicle (EV) charging station solutions, announced they have been awarded a four-year, $1,568,108 value contract from the New York Power Authority (NYPA) for the deployment and management of more than 100 EV charging stations in 37 locations throughout New York State. These EV charging stations will operate on EV Connect’s open charging network and provide NYPA and its customers with real-time charge station monitoring, electricity usage, payment processing, reporting, demand response capabilities, and more. EV Connect’s management services will also eliminate NYPA’s need for hands-on charging station operations and driver support functions. EV Connect (TM) provides complete commercial and governmental electric vehicle (EV) charging station solutions, including procurement, installation, maintenance, management services, 24/7 driver support, and the industry’s most flexible cloud-based platform for charge station management software, enterprise integrations, and EV charging applications. 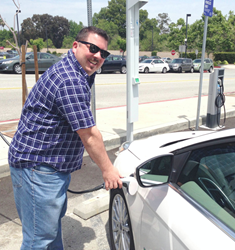 Established in 2009, EV Connect's customers include Marriott, Warner Bros., 20th Century Fox, Los Angeles Metropolitan Transportation Authority, and numerous public and private sector companies and organizations. For more information please visit http://www.evconnect.com.